FREE Expedited Order Processing and Worldwide Shipping with DHL Express (United States, United Kingdom, Europe, Canada, Australia, New Zealand, Mexico and many more…). FREE Returns & Exchanges! These Low Top LED Light-Up Sneakers will make you the center of the party. These dope kicks are perfect for heading out anywhere, a night on the town, raving or dancing until way, way, way past sunrise. If you want to be noticed then Glow Togs have the right shoes for you. These Patriot for Kids Low Top Premium LED Shoes have the USB rechargeable port conveniently fitted on the inside. No longer do you have to put up with short battery life, failing LEDs, dimming lights or recharging failures. These kicks are made to last for years to come. Just plug in a standard USB cable (included) to charge them (just like to charge your cell phone) and just 2 hours later you Glow Togs Kicks are ready to beam like never before. Want to change colors? Just tap the hidden button and you’ll be radiating to the new theme. Be warned – these are not like the light-up sneakers you might have had as a kid. These Hi-Def LEDs really are SUPER BRIGHT. They stay on whole time – not just when you move. These Patriot low top shoes have premium rubber soles. Don’t let the color make you think about showing dirt. After a hard night they’ll still be looking fresh but, if you want to touch them up, just use a damp cloth and they’ll keep beaming even stronger. Buy Now and qualify for FREE Express Shipping. Every shoe manufacturer has slightly different sizes. Be sure to check out our guide below before you place your order. Shoes are ordered by selecting the US Size. We use Unisex sizes so be sure to check your foot size. WOMAN’S SIZES – please note Unisex sizes are defaulted to Men’s sizes. Click here for this International Show Size Guide to help work out what size you are. Our best recommendation is for you to stand on a piece of paper (with the normal socks that you wear) and draw a line at the heel and toe. Now measure this line (in millimeters – it’s more accurate). 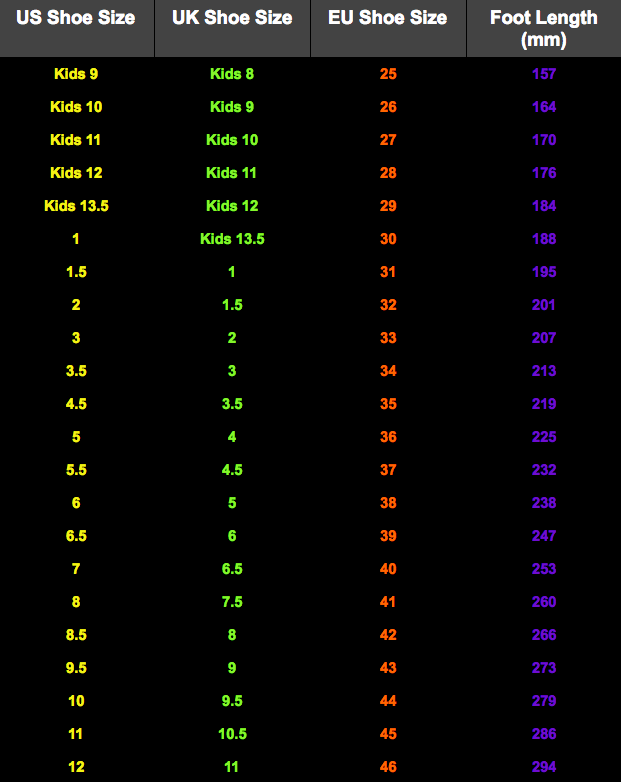 Take the corresponding US shoe size value from our shoe size chart. Always round up. For example, if you measure 254 mm then round up to a US size 8 (260 mm) and not a US size 7 (253 mm). You don’t want your toes to get squashed on a big night out. Still stuck? Email us and we’ll help to figure it out with you. We know that getting your new Glow Togs on your feet as quickly as possible is an absolute priority and we will do everything we can to make that happen. Our Express Shipping (we use DHL) takes 3-5 business days depending on where in the World you are. We aim to process all orders within 48 hours – it’s normally much quicker than that although at busy times it can sometimes take an extra day. If you need your Glow Togs for a specific date then we recommend ordering them at least 10 business days in advance. This just gives a bit of buffer space in case a huge hurricane hits and planes don’t fly and delivery van tires go flat and all of those tiny things that probably won’t happen but, hey, you never know – we’d hate to spoil your event and not have the right kicks on your feet when you’re dancing the night away. Why should I choose to get my shoes from Glow Togs? We pride ourselves in producing high-quality products that our customers love. We want you to be seriously happy with the shoes you buy. We want you to love our products. We want you to tell your friends that Glow Togs are dope and to come to us to buy their LED Shoes. To make that happen we have awesome customer service. We expedite our order processing and provide FREE Express Shipping. We use the highest quality products and make sure that they’re tested. Check out our competitors. Do they have certifications for the batteries that they use (we do)? Have they tested their LEDs (we have)? What bend test did they do on the LEDs (our factory certifies them at an amazing 40,000 but we did our own and stopped at 50,000!)? Do they have premium rubber soles and high quality, durable PU lining (we do)? if you’re still not sure, try us – we know you won’t be disappointed. Do your LEDs light up in different colors? Absolutely. Every pair we have lights up in 7 different colors and also has a rainbow setting where it will alternate through the colors – in all, there are 11 modes. What colors are the LEDs and what are the settings? Is your Express Shipping really free? Yes. We know that people want their Glow Togs fast. That’s why we expedite our order fulfillment process and offer free Express Shipping Worldwide with DHL Express. But, you need a coupon to enable the Free Express Shipping. Don’t have one? No problem. Just enter FREESHIP at Checkout. We only offer Express Shipping with DHL Express – we know you want your Glow Togs gear quickly and ship Worldwide. It’s FREE too. Just use coupon code FREESHIP at checkout. Worldwide. And it’s free. Seriously. We use DHL Express for fast worldwide expedited shipping to get your Glow Togs gear to you as quickly as we can. It doesn’t matter where you are in the world – we’ll get your gear to you. Use coupon code FREESHIP at checkout to make this Free. Are there any customs or import charges? Every country is different. Since we ship worldwide it’s hard to have a definitive list. We can’t be held responsible for customs or import charges. We recommend a quick google search or to contact your local customs department to get up to date country-specific information.